Focused on in-depth long-form journalism and essays, What Future tackles issues critical to our future: climate change and human migration, feminism and gender politics, digital rights and AI. From the food systems of the future and built-in environments to constantly evolving systems of justice and surveillance, what kind of future do we envision for people and the planet? The 2018 edition will be published in September of 2018. Meehan Crist is writer-in-residence in Biological Sciences at Columbia University. Previously she was editor-at-large at Nautilus and reviews editor at the Believer. She is the host of Convergence, a live show and podcast about the future. Rose Eveleth is a producer, designer, writer and animator based in Brooklyn. Most recently she helped ESPN's award winning documentary series 30 for 30 launch their podcast and is currently the producer and host of Flash Forward, a podcast about the future. 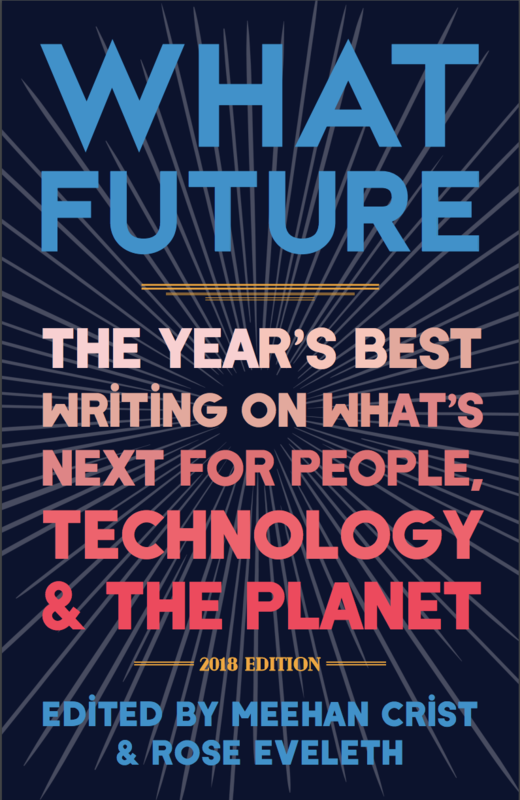 Submissions should be made to info@unnamedpress.com with “What Future” included in the subject line. We are seeking a varied collection of articles, essays, other forms of journalism (including profiles of thought leaders and scientists), and creative non-fiction published during the calendar year of 2017. We are primarily interested in long form, in-depth pieces that consider a given topic carefully. The article must have been originally published between January 1 and December 31 of the eligibility year.